For some lucky kids each year, their birthdays will fall on April 22, Earth Day in the US. This day is set aside to celebrate the earth and learn more about nature. What better way to celebrate an Earth Day birthday than with an Eco-party? Here is how parents can put together a green birthday party for kids that also honors Earth Day. Almost every birthday party starts off with games. An Earth Day birthday party should be full of green games that give love to the earth. Planting flowers is a fun outdoor activity for kids that helps the earth. Kids should be given seeds, small pots, and small shovels. If there is not an appropriate area for digging, bags of potting soil can be included. Parents may also want to purchase and hand out bags of worm castings. Not only are these great fertilizers for plants, but also a great way to discuss composting with kids. Making paper is another fun activity that would work great for kids of all ages. Old paper can be recycled into new sheets with a blender, water, and time. Making homemade paper can take time, but the sheets can then be used to send thank-you notes to all the party attendees. 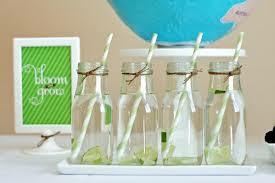 Parents can also add a green twist to many typical birthday games. “Pin the tail on the donkey” can become “pin the leaf on the tree”. Kids can play bingo using nature based bingo cards, with plants and animals instead of numbers. For the truly adventurous parents, a tie-dye station could be set up with natural plant-based dies and organic cotton shirts. At most birthday parties, the treat bags handed out are cheap plastic bags filled with unhealthy candy. For an earth Day birthday party, the bags are a little different. Parents could use small reusable cloth bags to put treats in. These bags can be reused by the kids as lunch sacks or to carry toys in. Reusable metal pails also work great, and can be the perfect addition to a party with flower planting or at the beach. Instead of the typical candies and small, junk toys, parents can fill the bags with Eco-friendly treats. Pencils and notepads made from recycled materials, packets of seeds, and natural treasures such as pretty rocks and sea shells are great treats that many children would love to get. Parents that want to add some candy should look at the healthier options. Organic fruit leather, bags of nuts, and honey sticks are simple treats that are great to give. Parents can check out their local health food stores for organic and natural treats that kids will love. When thinking about a cake for Earth Day there are many design choices. The most obvious are a round earth, a flower shape, or a nature themed cake. A cake with images of plants and animals on it, or of a particular earth scene would make a great cake choice. To make the cake parents should look for organic, natural ingredients. Honey instead of sugar is a great way to sweeten and add nutritional value to foods. Food coloring can be made from crushed berries instead of artificial dyes. Some parents may try a vegan chocolate cake to keep their cake as earth friendly as possible. Celebrating a birthday on Earth Day is a very special occasion. With a little careful planning and preparing, parents can pull off a party that is both fun and Eco-friendly. Choosing the right games, the best treats to hand out, and finishing it with the perfect cake will make any birthday party a huge hit.